Matches. LIVE reported from Drammen. 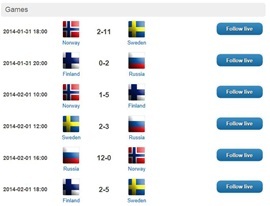 Quick Statistics from CoveritLIVE matches reported from Drammen. It is a lot of hard working, also from LIVE reporters. Thanks to Kjetil Heen, Even and Felix. Now we also have the posibility to provide "Elitrapport" from all matches. Because we have never used "Elitrapport", we will continue to use "CoveritLIVE" aswell, and you will be able to read them both from Drammen. Hopefully you'll get what you need. Please wright us comments or questions. Use "Guestbook" in left menu. 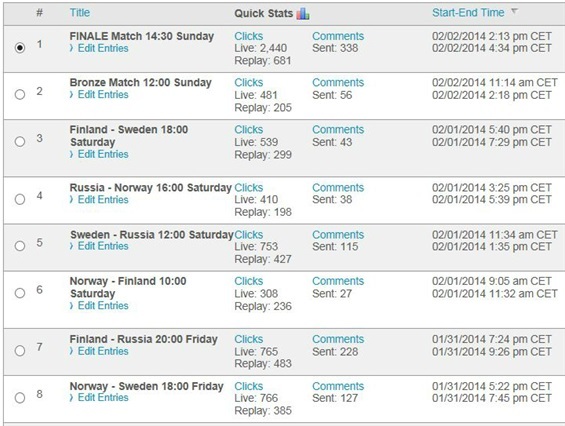 All matches from Drammen this weekend HERE. All matches will be Live reported from Drammen. Hopefully someone back home will follow us..
We use "Coveritlive", and you are welcome to interactiv with questions and comments during matches. Read more about that below. We will publish most of your comments, and answers your questions, the best we can, as fast as we can. All LIVE-reports are listed, one by one, at the links after every match in the list above. All LIVE-reports can be replayed after match, from the same links. Hopefully you will follow us, and send some comments. This is Our Logo in Drammen, for all matches in this tournament. This is Live Events. The format allows Writers to publish commentary, news, polls and media items in real-time. Enjoy instant updates! The 'autoscroll' feature ensures that you are always shown the newest content without having to refresh or scroll. Your submitted comments are published at the Writer's discretion. The Writer can view all comments sent to them but only they can publish comments for everyone to see. Use the icons at the bottom right of the window to control auto-scrolling, translation, mobile and other Reader options (may not be available for all events).